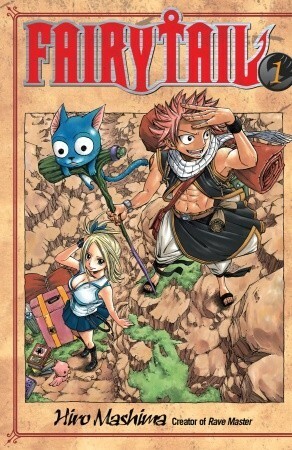 I don't know what to think about the first volume of the Fairy Tail series. It was a bit of a mess. Like most first volumes, it was confusing but the problem was that there wasn't much to capture me. Lucy is a fledging wizard who wants to join the cool kids' club, the Fairy Tail wizards guild. On her journey to find the Fairy Tail group, she first encounters Mr. Right. He's charming, handsome, charismatic, and all the girls love him. But like Gilderoy Lockhart, he is merely a good looking fraud. To her credit, Lucy sees through Mr. Wrong quick enough - although she does nearly get herself enslaved on a yacht - and switches her hopes to a screw up named Natsu. In Natsu, she's chosen right. Natsu seems like a loser, but he's a member of the Fairy Tail guild. And while he is an eccentric character, he's also brave, resourceful, and clever. The Fairy Tail members we meet really are the cool kids. I can see a lot of fun potential stories in them. But here come the problems. It didn't feel real to me. Obviously it's not real and in many cases, a very flexible imagination is required to appreciate manga, but I just didn't believe it. The two big crises, the yacht and Natsu running of to save a kid's father, just show up out of nowhere. It felt clunky. Also, I didn't like the fact that Lucy had huge breasts and wore a very low cut shirt. Not that there is anything inherently wrong with that. I realize this is a series targeted more to teenage boys, so I understand why Mashima drew her that way, but it's not how I get my kicks. One more thing - an admittedly shallow pet peeve - I keep trying to spell the title "Fairy Tale" - makes it super hard to right an accurate review. Have any of you read Fairy Tail? Should I keep going? Oh, that's too bad! Regardless of whether it's manga or not, you want a story to feel real enough to become invested in it. If you don't have that, you're missing the essential link, you know? Great honest review, Alison. I was going to ask about the title Alison! I was wondering if the members did all in fact have tails, and that's why it's spelled that way, but it doesn't seem like that's the case if the group consists of wizards. I'll be interested to see if some of the issues you mentioned will be addressed in the second volume and if it reads more smoothly! This one never interested me. I feel like I tried to pick this one up and had the same issues. Try the second volume and then give up if it doesn't get better. Ugh. I hate when this happens, and it happens a lot actually. I'm so disinterested in the first volume of a series that I just don't try the rest of it. I LOVE THIS anime! but I dont't like the large breasts, it's too much!